At least once a month, he says he could sell our house and asks if I’m ready to move. He could have sold it three times this month…right, Justin? I have no doubt in my mind. Truth is, we would both rather help our clients find homes than do it ourselves. “I Got a Guy” for everything from who to order flowers from to the best coffee shop in town as well as contractors, plumbers, painters etc. Our cars have high mileage…130,000 miles to be exact. I watch my husband drive our street like a tennis match back and forth back and forth while “finishing up calls” on his way home. For fun, he drives through neighborhoods. He happily gives tours of Fort Wayne to potential new residents and is a huge advocate for the city of Fort Wayne. It’s tough on me seeing “Other Signs.” I get defensive when I find out friends, family or people I know used “another realtor.” It’s especially difficult when they live on our street and I have to drive by the sign daily. It puzzles me when after selling three homes on our street in less than a day they would use someone else. He can’t and won’t sell them all. Being married to a realtor for 15 years, I am learning there are other agents who will do a great job. We sometimes need to humble ourselves and appreciate the competition. Unpredictable: My husband leaves the house with “no appointments” scheduled for the day and says “I might be home early around 3 or 4,” but “Things came up,” “I was putting out fires,” “We had two referrals I needed to call by the end of the day,” and “Clients called right at 5 o’clock when I was leaving the office,” so “I won’t be home for dinner.” Unpredictability is teaching me flexibility, grace and proper expectations. Some may say that being married to a realtor means you have no weekends. I’m happy to say that because we have an amazing team and clients, we do have weekends and vacations where we spend quality time together. After all, love is spelled T-I-M-E. It has taken a few years, but he is intentional about putting our family first. He builds Character and Strength through relationships observing his patience as he walks alongside people at their best and at their worst. During stressful large purchases, he is energized and focused. He spends hours on the phone understanding, negotiating, advocating, empathizing and counseling. 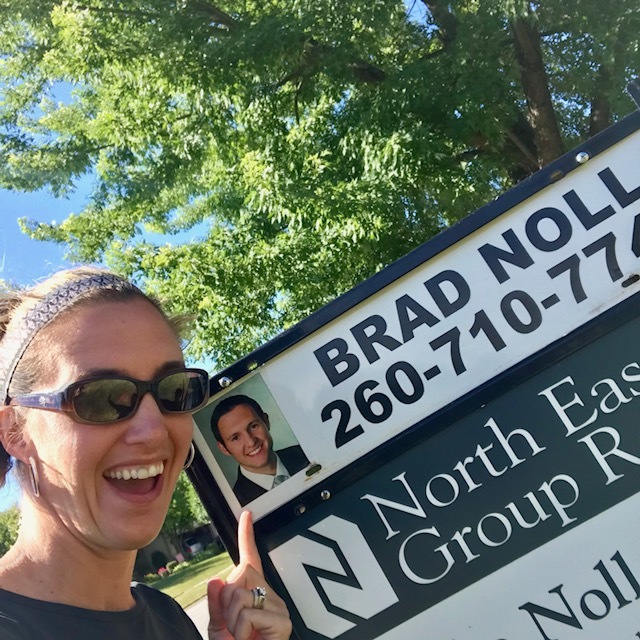 Proud: I pass his real estate sign in town, and I snap a selfie with it. Good Conversation: Many conversations revolve around the local housing market. My husband is constantly learning and educating himself on the market. This equips me for these everyday conversations. When we could be watching television at night, we are usually at our kitchen island planning the next client party, discussing business strategy or revisiting the latest Buffini podcast. There is no lack of conversation or busyness running our own business. Serve others on a daily basis. Above all, running a business gives our hearts an avenue to serve. It provides the means to meet unique and interesting people, commits us to providing the most basic need of housing and build a sense of community where we live and serve people with the best version of ourselves. I see the behind the scenes work my husband puts in on a daily basis to be the best he can be for his clients. To ultimately serve them in a way that he can “put his name to.” He spends countless hours studying, being coached and mentored, reading, analyzing and improving his business. Real Estate is not a part time job to him. My Favorite, Fun: I get to see the smile and enthusiasm he has when he makes the phone call to say “You got the house! !” Priceless. We’ve driven to clients homes at 11:00 at night, rang the door bell, and celebrated in person with adrenaline flowing and glasses clinking. Toasting to another American Dream being lived out right here in Indiana makes every moment worth it.